Over the last few months I’ve been thinking a lot about the power of teachers. Some say teachers have no power, they’re just glorified babysitters, and to them, I spit in their face I say they’re wrong. A teacher is incredibly powerful. They have the ability to positively impact a child, to change their life really. They also have the ability to scar them. Power! For me, 12 years in School District 34, I was lucky enough to have had four unforgettably incredible teachers, two in elementary school (back-to-back) and two in high school. Today, I give special thanks to one of those teachers. Bradner elementary. Grade 5. 1987-88. Ms. Duma. 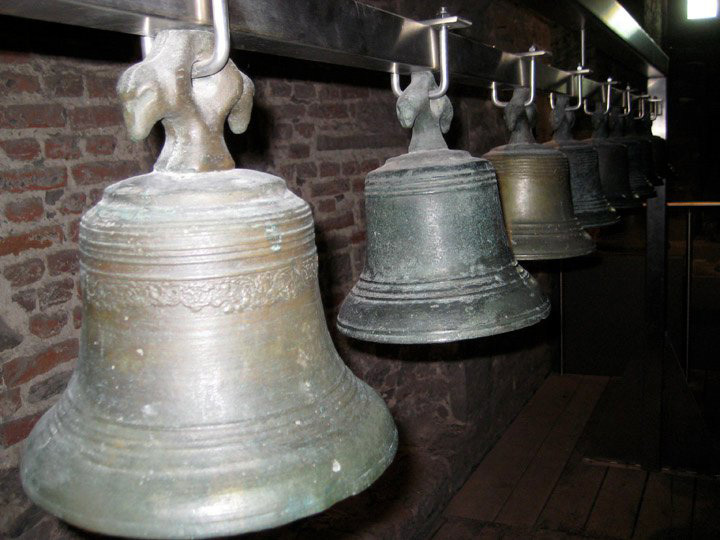 When we were up in the Bruges Belfry, it was Ms. Duma I thought of the second I saw these – biggest handbells EVER! 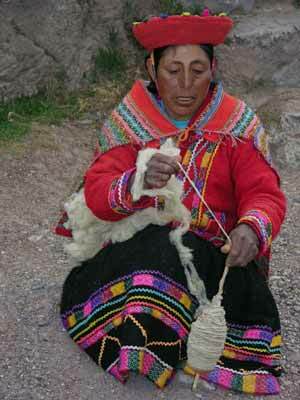 It is because of Ms. Duma – and a postcard from Peru – that my dreams of travel were first ignited. It was in my year when she and her husband decided to adopt a baby from Peru. They left in May of that school year and while some teachers wouldn’t have looked back, she did. Many times. We received regular updates of her travels, and in the summer break, I received a postcard from her with an Inca woman dressed in traditional attire. It was in that postcard, that she informed me she would be bringing home not one, but two babies! I still have that postcard. And so Ms. Duma, I thank you for starting my jet setting dreams. And it is because of Ms. Duma that my standards for other teachers skyrocketed. Ms. Duma never forgot her students. Not when she was becoming a new mom in Peru, not when they transferred to other schools, and most definitely not when they were feeling alone and scared in a cold, sterile hospital bed at BC Children’s Hospital. That year, just one year fresh of my diabetes diagnosis and the start of my downward spiral of disease denial, I spent a lot of time in the hospital. A lot. But next to my bed, there was a card, a giant handmade card, the size of a poster board folded in half, wishing me better with signatures and funny comments and drawings from the entire class – at the prompting of my dear teacher. I think, in total, I got three of those cards that year. And so Ms. Duma, I thank you for those warm, fuzzy feelings I got, when I so desperately needed comfort, every time I opened those cards. It’s been 23 years since I was in Ms. Duma’s class, and thanks to Facebook, to this day, she continues to make me feel like I am one of the most special, talented, beautiful people on this earth. That is the power of an amazing teacher. That is what every classroom needs. And I am honoured to call this woman, one of my most favourite teachers in the world, whose first name is Ms., my friend. After 26 years in the same school (how often does that happen?) 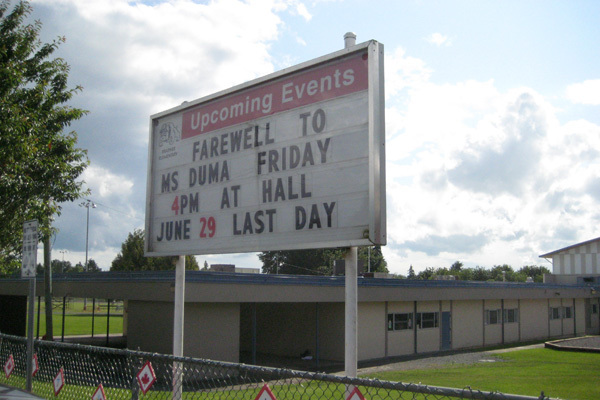 Ms. Duma is retiring at the end of this school year. Today was her going away party where there were students from all eras, young and old, parents and teachers too all vying for her attention. 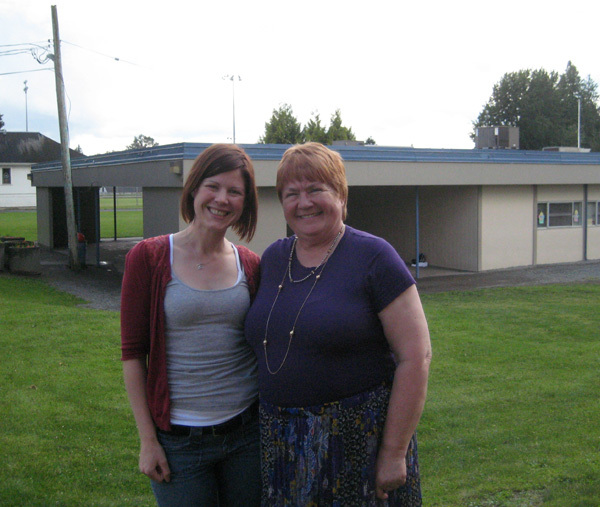 When I walked through the doors of the hall next to the school (where we used to have potlatch dances!) the first thing I saw was a projection of old photos, and you know which one was showing at that very moment, the one of my class! Did a teacher impact you? If so, how? A glorified babysitter??? Seriously!?!? Who says things like that? Thank you Katie for the wonderful tribute! But you also were a student I never forgot…and when I taught your nephew years later and had the opportunity to see you all grown up and looking so healthy, I was so happy. Seeing you become a writer, an athlete and a traveller is so wonderful! Keep up your enthusiasm for life!